39 million people in the world are blind, and 80% lost their sight due to curable and preventable diseases. Our research provides valuable information to help implement VISION 2020 – the global initiative to eliminate avoidable blindness. Find out more about our research. Our MSc Public Health for Eye Care provides eye health professionals with the public health knowledge and skills required to reduce blindness and visual disability in their population. ICEH is proud to support the Peek Vision project to expand access to high quality eye care. With a mobile app and lens adapter Peek Vision provides an easy to use, affordable and portable system for testing eyes, whether in a clinic or in the comfort of a patient’s home. Find out more about Peek. We are co-ordinating the Commonwealth Eye Health Consortium, a group of eye health organisations working together to deliver an exciting programme of fellowships, research and technology to strengthen eye health systems throughout the Commonwealth. The VISION 2020 LINKS Programme works to improve quality and quantity of eye care training, mainly in Africa. It works by matching an African eye department with a UK eye department in a partnership to train the whole eye care team. Find out more. Rapid assessment of avoidable blindness (RAAB) is a rapid survey methodology developed by ICEH to provide data on prevalence and causes of visual loss for the design and monitoring of eye care programmes. Find out more about RAAB. A consortium of eye care and health experts, coordinated by ICEH, has developed the Eye Health Systems Assessment (EHSA) approach to provide a rapid, comprehensive assessment of key health systems functions and how they interact with the eye care system. Find out more about EHSA. Our Community Eye Health Journal aims to ensure that up‐to‐date, relevant information reaches eye care workers of all levels in the countries where the burden of visual impairment is greatest. Find out more about the journal. The International Centre for Eye Health (ICEH) is a research and education group based at the London School of Hygiene & Tropical Medicine (LSHTM). We work to improve eye health and eliminate avoidable visual impairment and blindness, with a focus on low-income populations. Our eye health research provides valuable information and evidence in support of the VISION 2020 initiative to eliminate global avoidable blindness. Explore ICEH research. See details of our MSc Public Health for Eye Care at LSHTM, and find short courses for eye care professionals. Find a course. Learn how the VISION 2020 LINKS programme is improving eye care training in Africa and the UK. Read about LINKS. Our quarterly journal is sent free to eye care workers at all levels in countries where the burden of eye disease and blindness is greatest. Find out more about the journal. 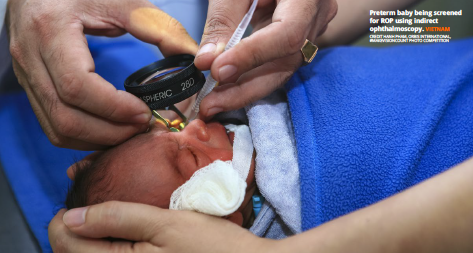 Coordinated by ICEH, the Commonwealth Eye Health Consortium is a group of eye health organisations working together to deliver an exciting, integrated, five-year programme of fellowships, research and technology. Find out more about the Consortium.